Chocolate and juggling combined in a fabulous convention, what more could any chocolate-loving juggler want? Every year hundreds of jugglers from all over the UK come to York for what is said by many to be among the best one-day juggling conventions in Great Britain. As well as workshops in all manner of circus skills and the chance to win prizes in the Chocfest Juggling Games, the day culminates in a world class show. Over the years Chocfest has brought many international performers to the UK. CCCC, Chocfest Chocolate Cake Challenge (started in 2000), is an opportunity for attendees to enter a chocolate cake in return for discounted entry, the cakes are judged and prizes are awarded in the show and the cakes shared with the audience during the show interval. In 1996 York Jugglers (from both university and town) organised a one day juggling convention in York, this became an annual event. It was originally called Ye Olde Yorvik Juggling Conventione, but by 1998 had become known as Chocfest due to the abundance of chocolate at the convention (chocolate bars were given to all attendants as well as chocolate for prizes in the games) and the fact there were two chocolate factories in York at the time (Terry's and Rowntree). The first seven conventions were held at York University, Chocfest L8 was held at Archbishop Holgate School, Chocfest IX was held at Fishergate Primary School, Chocfest then moved to Joseph Rowntree School for the next 4 years till the school was demolished in 2008. Chocfest then moved to Selby Abbey for two years before moving back to the rebuilt Joseph Rowntree School in 2011. For 2012 to 2018 Chocfest moved to Manor C of E School in Nether Poppleton. See map. Traditionally Chocfest is held at the end of January, but has been held in February, March and even July, the first two were held on a Sunday, but all subsequent ones have been held on a Saturday. Chocfest was also where the internationally renowned sport of Stredging originated from at the turn of the century. (Explanation of Stredging). Chocfest V in 2000 was used as a fund raiser for the British Juggling Convention held in York in April of the same year, BJC2k (as it became known) was organised by York Jugglers and friends. Chocfest X in 2005 raised money for victims of the 2004 tsunami. The profits from Chocfest 2013 and 2014 (and all money held by Chocfest) were given to BJC 2013. Various passes have been used for Chocfest over the years, some of the early ones were generously supplied by Beard Juggling. The Chocfest logo of the juggler wearing a viking hat was created by Charlie Dancey, who is a professional juggler and author of several juggling books. Stu and Loopy Lou (bounce juggling). July 3 2004 Chocfest IX - still not on time Fishergate Primary School Magic Kev and Molly. compères: Sweavo, LP, The Void, Yoyo Monster, Al, Patrick and Charlie. Sweavo (compère). 230, £9, pass made from recycled plastic bags. Stumpy (compère). 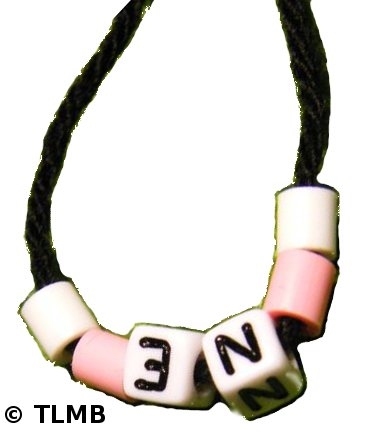 250, £9, pass made from alphabetti-beads.